Printed wrap and tissue are available in counter, retail and jeweler rolls as well as in sheets. Over 500 designs available from stock, including...holiday, birthday, special occasions, floral and masculine. Looking for a trendy paper design, like leopard-skin? E-mail us and request a sample sheet or catalog. Over 500 Designs Available from Stock. Looking for a new product to show off a "custom-look"? Offer your customers your own line of gift wrap. Our Design Action Team can assist in creating your own Private Label line. Choose designs (or create new ones) and we'll tailor them to your exact needs. Your "Private Line" may be converted to retail rolls or folded packages. We can create your own label and attach it to each retail roll or package. Should your specifications require sheet fed printing, this too may be automatically wound and labeled into retail rolls. Click here to visit our Design Studio page or E-mail Us. A Few of our Newest Holiday Designs! To order, please call 1-800-842-6656 or E-mail Us for a quote on your specific needs. 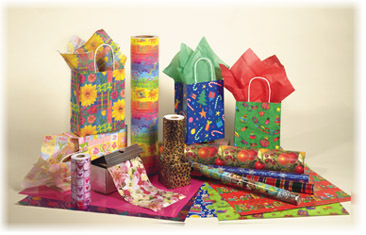 Gift Wrap is the number one product sold nationally for school fundraising. Our fundraising division, Genevieve's, has been a leader in directly supplying schools and organizations with quality fundraising products. Click here to visit our Genevieve's site.